All this swept through his mind as he moved into position behind the ruins of a long-demolished building. The command channel cracked open and he heard the voice of his Kreeghor luitenant in his Warlord suit: "Units 4 and 5, move forward to... What the HELL!!! GETTHEROFFAME! GETTHEROFFAMEEEE!!!!" Several loud thunks and a crunch folowed, and the channel went dead. Draven swung around and ran, rounding the corner of the building where his commander was. As Draven rounded the corner he was just in time to see a huge furry humanoid pull her vibroknife out of the splintered helmet of his commanders powered armor, and his blood froze in his veins as he recognised the figure and horror overtook him. A K`Taara, HERE?! While this went though Dravens head the K`Taara looked up at him, with eyes that were filled with hate. Draven started to lift his railgun. Huge muscles bunched beneath the furry skin and she jumped at him. The K`Taara are a race of large humanoid felines. Their homeplanet K`Tar had a high gravity, no less than 2.1 standard G`s, and was very rich in rare elements and free fluorine. This, coupled with its radically tilted axis, which gave it utterly unpredictable weather (already more powerful because of the high gravity) made it a unusually hostile place to live on. War and strife had always been a hallmark of K`Taara society, and the conflicts that have raged over the planet have been numerous, with the race nearly exterminating itself several times in a nuclear holocaust. Less than twohundred years ago the K`Taara finally united the entire planet under a single rule, and peace spread over the globe. Freed from the yoke of war the K`Taara reached out into space, and used primitive fusion rockets to explore their solar system. Seventy years ago they found the secret to a primitive FTL drive, and began to explore the starsystems in their neighborhood, finding many interesting things, establishing new colonies, and making contact with new lifeforms. For the first time in the history of their race the K`Taara experienced a Golden Age, and for the triumphant K`Taara it seemed to on into eternity. Ten years ago a Kreeghor scout stumbled upon the fledgling K`Taara sphere of influence. The Kreeghor had just fought a terrible war with the REF under Admiral Moore, and had lost badly. The TGE needed raw materials, slaves for manning factories, and a nice little victory to bolster the morale of its legions. The K`Taara were a godsend, and the deciscion to invade K`Tar was quickly made. Bypassing the small colonies the TGE taskforce made its way to K`Tar, where it appeared in the sky without warning. The colonies could be mopped up later, the TGE commanders thought. First the homeworld had to fall, and this would not be too difficult. These people were still backwards, and easy prey. It was a mistake the TGE came to regret. It was a rout. Instead of the quick victory they expected the TGE Legions ran into hastily but expertly raised defenses, a leftover from the end of the warring age of the K`Taara race, only decades ago. Added to this were waves and waves of eight foot tall females, capable of tearing a Kreeghor to bits with their bare claws. The Invasion turned quickly into a retreat, and only in a few spots the invaders had time to dig in and to fortify themselves. The campaign was further complicated when it became obvious that the K`Taara were willing to use primitive nuclear weapons on the surface of the planet. After seven years the TGE had four complete legions situated on the planet, and had won less than a quarter of its surface, most of it useless and irradiated. The Emperor decided that K`Tar would not become a second Axis-5. The legions were withdrawn, and even as the K`Taara started to cheer the first of the orbiting warships dropped their antimatter bombs. Within a week the planet had been reduced to a glowing radioactive slagheap. The K`Taara race had not been wiped out however. In the initial haste of the rush to get to K`Tar the TGE had bypassed most of the colonies, and several primitive FTL ships. Over a million K`Taara from the colonies managed to escape as the TGE came to destroy their homes too. Many of them fled into the society of the Three Galaxies, but more and more are joining up with the Free Worlds Council. The strong and fast K`Taara make excellent soldiers against the Empire, and the FWC welcomes all of them with open arms. For their part the K`Taara are all too happy to strike back at the monsters that destroyed their homeworld, and many of them devote their hearts and souls to the task of killing as many Kreeghor as possible. Note: The Statistics in brackets are for male K`Taara, where only one set is given the stats count for both sexes. Appearance: A K`Taara looks a bit like a tiger would if you poured one into a (large) human shape, tail, claws, and all. All K`Taara are fully covered with a short fur, which usually has a rich pattern of several different colors. Monochromatic furs are very rare. A K`Taara`s eye are slitted, and have a orange/yellow color. 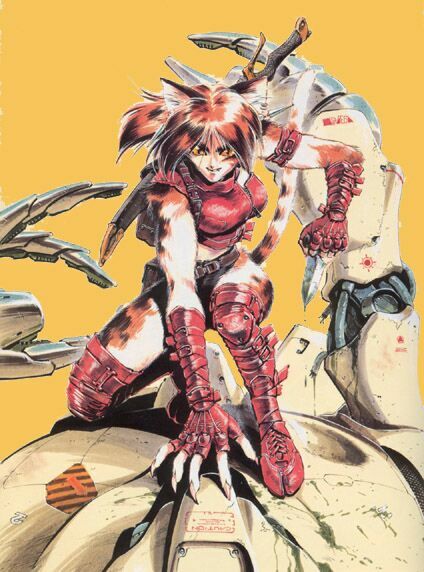 The Females are much larger than the Males, and are rather stronger too, although both sexes sport claws capable of slicing through hullmetal and are much stonger than humans. Also, 80% of all K`Taara are females! Natural Abilities: Supernatural strength and endurance, regenerates 2D6 M.D.C. per hour, enhanced reflexes and speed, Nightvision 80ft (24.4m), superior sense of smell and hearing, recognize common/known smells 50%+3% per level of experience. Track by smell alone 20% +4% per level of experience. Track by hearing alone 15% + 3% per level of experience. Psionics: Standard as humans, plus all K`Taara have the power of Sixth Sense. Combat: Three (two plus tail) hand to hand attacks without combat training, or three (two plus tail) plus those gained from hand to hand combat and/or boxing. Bonuses: +2 (+3) on initiative, +2 to strike and parry, +3 to dodge, +1 to pull punch, +2 to roll with impact, +1 to save vs. horror factor, (males also have +1 to save vs. psionics, +1 to save vs. magic. ), and take half damage from poisons and toxic gasses. Damage: Prehensile tail does 1D4 M.D. (+1 to strike and parry with tail, the tail has +5 to dodge. +10% to climbing), Claws add 3D6 (1D6) M.D. to hand to hand damage, and their bite inflicts 1D4 M.D. Vulnerabilities/Penalties: A K`Taara can`t swim! Their bodies are far too dense to float on water! Because of the high levels of metals in their bodies and their peculiar biochemistry all electrical attacks do double damage. Enemies: The TGE, and the Khreeghor in particular. Language: K`tarrian and Trade One at 98% (males one other at +10%)Note, K`Tarrian is rapidly becoming a extinct language. WP Two Modern and Two Ancient, usually (but not always) one of these is either Sword or Knife. Females tend to go for Men at Arms OCC`s, with the Freedom Fighter OCC most often seen, although some make good power armor pilots. For the Freedom Fighter, replace the standard Naruni Plasma cartridge rifle with a Naruni NE-75H"Shoulder Cannon"(PW sourcebook page54) with a extended 16 round clip of the large cartridges. They are capable of using these weapons as a normal rifle, with a standard rate of fire! Take note that females are really bad with electronics, so all Technical and all Electrical skills have a -5% Penalty! They tend to stay away from the more cerebral OCC`s. Males tend to stay away from Men at Arms OCC`s, the only exception being piloting OCC`s, be it various planes, spaceships and powered armors. They take the more mentally challenging OCC`s, and are fairly good in science, although they do not have any specific bonuses for it, other than those from their intelligence and the OCC bonuses. Image drawn and copyrighted by Masahisa Suzuki, taken from the artbook Paradise Play..
Writeup by Mischa (E-Mail Mischa). Copyright © 1999, Mischa. All rights reserved.